Aromatase inhibitor induced musculoskeletal syndrome is experienced by approximately half of women taking aromatase inhibitors, impairing quality of life and leading some to discontinue treatment. Evidence for effective treatments is lacking. We aimed to understand the manifestations and impact of this syndrome in the Australian breast cancer community, and strategies used for its management. 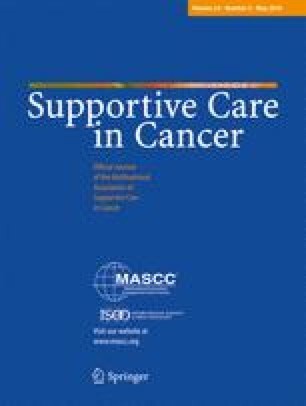 A survey invitation was sent to 2390 members of the Breast Cancer Network Australia Review and Survey Group in April 2014. The online questionnaire included 45 questions covering demographics, aromatase inhibitor use, clinical manifestations and risk factors for the aromatase inhibitor musculoskeletal syndrome, reasons for treatment discontinuation and efficacy of interventions used. Aromatase inhibitor induced musculoskeletal syndrome was reported by 302 (82 %) of 370 respondents. Twenty-seven percent had discontinued treatment for any reason and of these, 68 % discontinued because of the musculoskeletal syndrome. Eighty-one percent had used at least one intervention from the following three categories to manage the syndrome: doctor prescribed medications, over-the-counter/complementary medicines or alternative/non-drug therapies. Anti-inflammatories, paracetamol (acetaminophen) and yoga were most successful in relieving symptoms in each of the respective categories. Almost a third of respondents reported that one or more interventions helped prevent aromatase inhibitor discontinuation. However, approximately 20 % of respondents found no intervention effective in any category. We conclude that aromatase inhibitor induced musculoskeletal syndrome is a significant issue for Australian women and is an important reason for treatment discontinuation. Women use a variety of interventions to manage this syndrome; however, their efficacy appears limited. Previous presentations: This work has been presented in part as a poster at the 2014 San Antonio Breast Cancer Symposium in San Antonio, TX, USA. We thank the study participants, the Breast Cancer Institute of Australia (BCIA) as the fundraising arm of the Australia and New Zealand Breast Cancer Trials Group (ANZBCTG), the ANZBCTG Trial Coordination Department and the Breast Cancer Network Australia for administering the survey. All authors have contributed to the planning and conduct of the study and the analysis of the data. All authors have approved the final submitted manuscript. No authors had any conflict of interest to declare. This study was funded by the Australia and New Zealand Breast Cancer Trials Group (ANZBCTG).